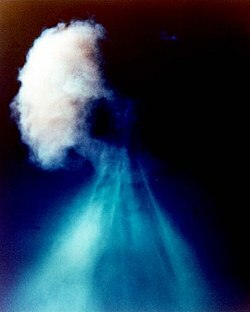 Plumbbob John Nuclear Test, a live test of nuclear AIR-2A Genie rocket on July 19th 1957. Fired by a US Air Force F-89J over Yucca Flats Nuclear Test Site at an altitude of 15,000 feet (4.6 km). The W25 was a small nuclear warhead developed by the United States Air Force and Los Alamos Scientific Laboratory for air-defense use. It was a fission bomb with a nominal yield of 1.5 kt. Development of the weapon began in 1954 at the behest of Douglas Aircraft for use against enemy bombers. The W25 was used for the MB-1 "Ding Dong", an unguided air-to-air rocket used by the Northrop F-89 Scorpion, F-101B, and F-106 interceptor aircraft. The MB-1 entered service in 1957, and was eventually redesignated the AIR-2 Genie. The only non-U.S. user was Canada, whose CF-101 Voodoos carried Genies until 1984 via a dual-key nuclear sharing arrangement. Limited numbers were still used for Air National Guard F-106 aircraft until December 1984. The W25 is 17.4 inches (44 cm) in diameter and 26.6 inches (68 cm) long, with a reported weight of 218-221 pounds (98.8 - 100.2 kg) . The W25 was described as a composite pit (utilizing both uranium and plutonium), unboosted, and the first US sealed pit design. A sealed pit means that a solid metal barrier is formed around the pit or nuclear material components inside a nuclear weapon, with no openings. This protects the nuclear materials from environmental degradation and helps reduce the chances of their release in case of an accidental fire or minor explosion. ^ "List of All U.S. Nuclear Weapons". www.nuclearweaponarchive.org.